Frank Scott-Walford was born in Perry Barr, Birmingham, around 1866, and trained as an engineer, and in 1901 was a fitter. In his playing days he was a goalkeeper, as an amateur, with Tottenham Hotspur. He became the club’s first professional and also was employed by them in their administration. He later played for London Caledonians, Lincoln City, Small Heath and Aston Villa. After leaving Villa he appealed successfully to the F.A. to be reinstated as an Amateur. While he never scaled the heights on the football pitch, he did show more flare in Management and Administration. He was credited with the formation of the Enfield and District League and became a Southern League referee. He was also a cricketer and cyclist. Scott-Walford became Brighton and Hove Albion’s Manager in March 1905, but just three months later he found himself with just three players on his books as the rest had left. With the start of the new season imminent he soon found himself in hot water for approaching players of other clubs before their contracts had expired. As a result of his actions, he was suspended from Management from 16th April until 1st August 1906. In the meantime, Scott-Walford inspired Albion to some decent performances during his time at the helm. In his first season, even though they finished in the bottom four, they beat Swindon Town 3-0 in the FA Cup. In the following season there was great improvement as they finished third in the Southern League. In 1908 they struggle near the bottom, but had a spectacular 1-0 victory at First Division Preston North End in the FA Cup before losing to Liverpool after a replay. 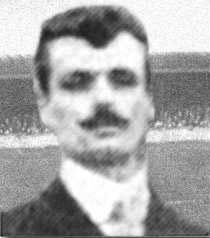 When Gilbert Gillies resigned as Secretary-Manager of Leeds City in February 1908, Scott-Walford was one of ninety applicants for the vacant post. He was the successful candidate and happily accepted the offer of the job when it was made on 25th March 1908, though he still had two years left to serve on his contract at Brighton. Brighton announced on 26th March 1908 that Scott-Walford would be leaving as soon as a replacement could be found. Scott-Walford took up his post at Elland Road on 1st April 1908. When Scott-Walford arrived, City were in a perilous position, fifteenth in the table and only six points clear of the bottom two, requiring four points from as many games to secure their Second Division status. They earned a point at Clapton Orient on 4th April 1908 but it was not until Good Friday, 17th April 1908 that they got their first win, by 3-0 at Elland Road against Stockport County. Next day, Easter Saturday safety was secured with the 3-1 defeat of Cup finalists Wolverhampton Wanderers and the population of Leeds breathed a collective sigh of relief. Scott-Walford always cut something of a flamboyant figure, with his extravagant waxed moustache and penchant for sporting buttonholes, straw boaters, bowler hats, caps and plus fours. But he was soon recruiting, signing striker Adam Bowman from Southern League Brentford on Easter Saturday and, though funds were very limited he rang the changes, releasing eleven of his first team pool and going back to the Southern League in search of replacements. Tom Rodger, Dickie Joynes, Jimmy Burnett, David Dougal and Willie McDonald followed their Manager North from Brighton in the summer. John Watson, Jock Hamilton and Tom McAllister joined their team-mate Bowman as they arrived from Brentford, John White came from Queens Park Rangers and Dickie Guy came from Hastings as the recruitment from Southern League teams continued. It was reported that Scott-Walford's investment that summer amounted to some £2,000. City opened the campaign with a 1-0 victory against much-fancied Tottenham Hotspur, as the fans warmed to their new team and the Manager had justified his position as sole selector, in the eyes of the big crowd of nearly 20,000 people. City rose as high as sixth in the table by December 1908, and pulled off a rare win in the FA Cup at the expense of Oldham Athletic. However, it was all downhill from there as City finished a disappointing twelfth at the end of the season. There was a bright light after Tom Morris was signed at the second attempt from Brighton in February 1909, and he was often described as the best centre-half in the Second Division. In 1909-10 there was another false dawn as Lincoln City were put to the sword in a first day 5-0 drubbing and it looked like Scott-Walford’s Irish close season signings had been a master stroke. Unfortunately it was another season of disappointment and City struggled all season to finish seventeenth and just avoiding having to apply for re-election. They not only struggled on the pitch but financially also, with Scott-Walford loaning the club £3,500 over the season and the club having liabilities of £10,800. With no money available for team improvements Scott-Walford returned to Ireland and came back with Mick Foley, Joe Enright, George Cunningham, Alec Creighton and the gifted Billy Gillespie. It was Scott-Walford’s personal approach that quickly persuaded Gillespie to turn professional and join Leeds. Gillespie never fully realised his potential with City but became a major star when he moved on to Sheffield United. Although their form was inconsistent, a nine game unbeaten run in February and March 1911 saw City finish eleventh. Once more Scott-Walford searched Ireland for talent in the 1911 close season but he could not pull any more rabbit’s out of the hat. City got off to a dismal start gaining just one point from the first four games and remained just as inconsistent throughout the season as they struggled in the relegation zone. Finances were also still a problem and City were enticed into selling Gillespie to Sheffield United for £400 just before Christmas and there was the threat of losing more players to make ends meet, with consistent Outside Right Hugh Roberts a likely candidate. Scott-Walford’s health started to deteriorate and as his contract was reaching its end he was feeling the pressure. He asked the directors to make proper financial arrangements or relieve him of his duties as Secretary-Manager, on 31st March 1912. The Directors took it as a letter of resignation. Thomas Coombes was appointed administrator of City’s financial affairs and they advertised for a Secretary-Manager. It was reported at the beginning of April that Scott-Walford had been appointed as Secretary at Nottingham Forest but it proved to be false. City were forced to apply for re-election at the end of the season in which they finished in nineteenth position. Scott-Walford was manager of Coventry City for only one season, the 1914-15 campaign. With the World at war, he took over at Coventry City, who had just been relegated into the Second Division of the Southern League, and was mainly involved in simply finding eleven players and just keeping the club going. Understandably, the season was a financial disaster and when the business was wound up in 1915, the accounts revealed that the manager was still owed £100 in unpaid wages. This was an all too familiar tale for Scott-Walford after his ill-fated days at Elland Road. The trail of Scott-Walford's career runs cold after his departure from Coventry and nothing else is known about his football dealings. It was unfortunate for a man who had shown himself so adept at the business of football management in earlier days that he should twice be employed by clubs in the financial difficulties. He was only one of many Leeds Managers who would disintegrate under the yoke of such bitter fiscal distress.